BoinxTV 2 is now mimoLive! Take part in the beta test of mimoLive - the successor to BoinxTV - to help us to build the best live video engine, which brings the power of a broadcasting studio to your living room. Stream your recordings to the best known streaming services and save hours of time typically spent in post production. 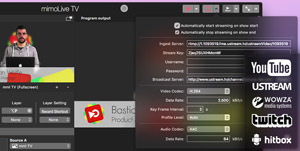 Broadcast your recordings live to YouTube, UStream, Twitch or any other RTMP based streaming service, without the need for any additional hardware. Simply set up your streaming service credentials, and start streaming. In BoinxTV we developed a really convenient way to display graphics, information and lower thirds within your recording. Sometimes it was a little bit hard to adjust its look and feel. Thanks to direct manipulation in mimoLive, you are now able to adjust all visual elements with ease. We rebuilt many parts of mimoLive from scratch, to make it more powerful and, at the same time, more stable. mimoLive now is ready to take advantage of the modern 64-bit hardware power. Add more video and graphics assets than ever before without the risk of running out of memory. Create great looking lower thirds and graphics with frosted glass effects. Thanks to a vast set of layers and visuals, your broadcast will look ready for primetime, as if the pros at today's major broadcasting companies had done it themselves. Naturally, mimoLive has a brand new look and feel. We beamed the interface into the next generation, giving it a more professional look. This allowed us to increase the usability of mimoLive. From now on, it is even more intuitive and convenient to use, so that everyone can enjoy it.